The 3-2 Tennessee Titans traveled to Seattle to face the 4-1 Seahawks in Week 6 of the regular NFL season. The Titans were deemed a big underdog in the game and very few gave them a chance to beat a very good Seahawks team at home. Sadly, they were right as the Titans played a very hard fought battle but could not seal a victory. Let’s take a look at the factors that stopped the Titans from pulling off a big upset. First and foremost, it must be said that the quarterback play was pretty bad. There is no way around it and to his credit Ryan Fitzpatrick acknowledged his bad game and took responsibility. It wouldn’t be fair to say the last two losses have been Fitzpatrick’s fault entirely but the Titans are sorely missing quarterback Jake Locker. Fitzpatrick was 17 of 29 for 171 yards and two interceptions while fumbling twice. He did once again lead the Titans in rushing with 6 carries for 33 yards. Fitzpatrick has now thrown 4 interceptions since assuming the starting role in the Week 4 game against the New York Jets. I know fans are concerned about Rob Turner’s play and with good reason but put me down as being less than enthusiastic about playing a rookie at center. 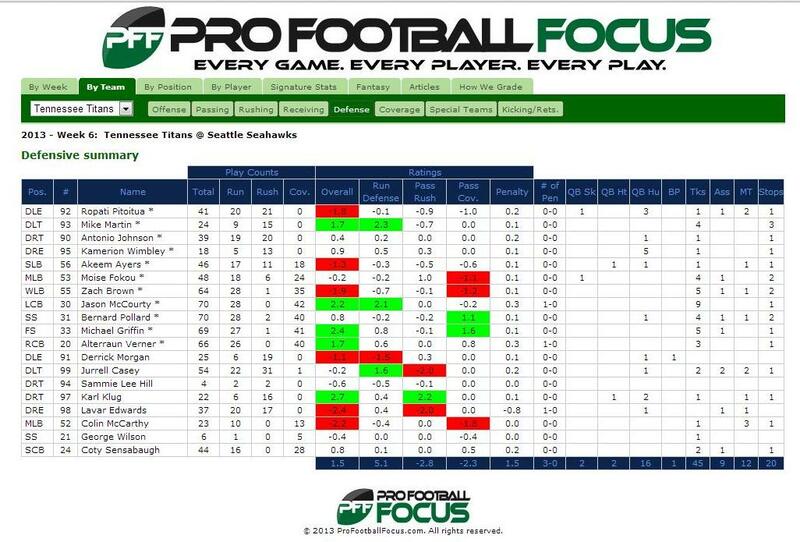 Turner has faced some really good defenses and in particular some good nose tackles. The interior of the line overall has really struggled this year. So far left guard Andy Levitre has been a bit of a disappointment. I don’t think a rookie center is an answer to the problem. I would like to see Byron Stingily get some work occasionally to rest David Stewart who is still struggling with injuries. Speaking of the running game, Chris Johnson also rushed for 33 yards but it took him twice the number of carries at 12. On the year, Johnson has 106 carries for 327 yards and zero touchdowns. His yards per carry average at 3.1 has him ranked 134th in the league in that category. After a few dreadful attempts, Johnson did start to put more effort into his game but it wasn’t enough to get the Titans going. With Jackie Battle down with a neck injury, the Titans inexplicably used Darius Reynaud to try and convert a 3 and 1 play. Fullback Collin Mooney only played one snap on Sunday. I have found no good explanation for either of those stats. Kendall Wright led the Titans in receiving with five receptions for 69 yards. The Titans had no passing touchdowns in the game and once again tight end Delanie Walker was one of the leading receivers as well. He finished the game with four receptions for 29 yards. Damian Williams made a really great play on a Ryan Fitzpatrick pass but also dropped a could have been a touchdown pass. Wide receiver Kenny Britt played two snaps and caught one ball for seven yards. The Titans defense once again was spectacular but they were unable to make up for the deficiencies in the offense. The defensive line played well at times but I felt this was their worst game of the year. Ropati Pitoitua in particular seemed to struggle. 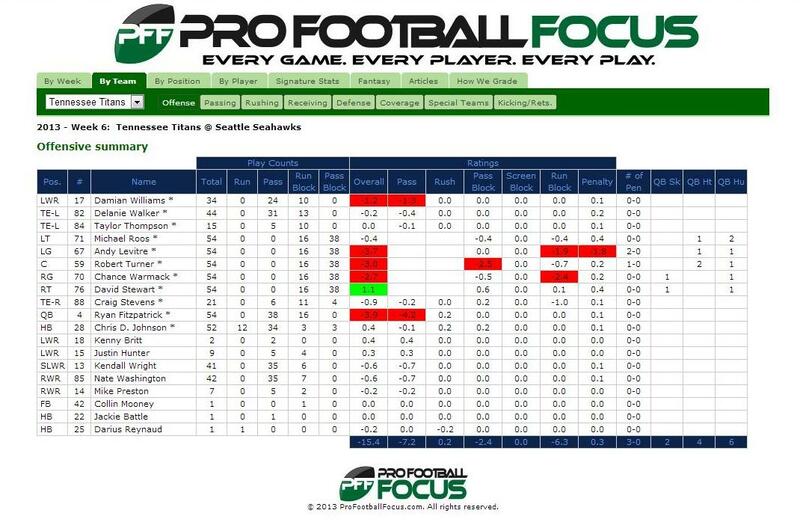 The Titans continue to have issues at middle linebacker with neither Fokou or McCarthy being overwhelming. I suspect the Titans will look to draft a middle linebacker in next year’s draft. Cornerback Jason McCourty led the Titans in tackles with nine, seven solo, which is generally a sign the defensive line has struggled some. He also had a fantastic 77 yard fumble recovery for a touchdown which kept the Titans in the game. Strong safety Bernard Pollard was the second leading tackler with nine and six solo and also recorded a sack. Pollard has put together a string of really strong games and so far has to be ranked as the top free agent acquisition from the offseason. Pollard leads the Titans in tackles with 45, 35 of them solo, and has been an underrated factor in the Titans defensive success. Gregg Williams gets the lions majority of the praise and it’s a shame since the players are really playing well on their own. Cornerback Alterraun Verner continues to play at an All Pro level and batted away several passes. Verner has four interceptions on the year and could easily have eight. He also leads the league in passes defensed with 17 and is simply playing outstanding football right now. He also has two fumble recoveries. Needless to say that cornerback competition seems like a dream now. Finally, special teams remains a bit of a concern. Punter Brett Kern struggled Sunday and botched another snap. Kicker Rob Bironas was 2 of 2 and seems to have hit his stride so long as he isn’t asked to kick a long field goal. The Titans the return game hasn’t been great but there were no big oopsies this past weekend. I suspect the Titans won’t make a move there and in the meantime we will always have this Titans fans. In the end, the Titans quarterback play probably cost them another win. As they say if wishes were ponies we would all sparkle, or something to that effect. You could make a persuasive argument the Titans win the last two games with Jake Locker under center. He wasn’t and they didn’t which pretty much sums it up. Hopefully, Ryan Fitzpatrick will settle in until Locker returns which won’t likely be until after the bye week. The Titans will face the San Francisco Forty Niners at home Sunday which is their code blue game.